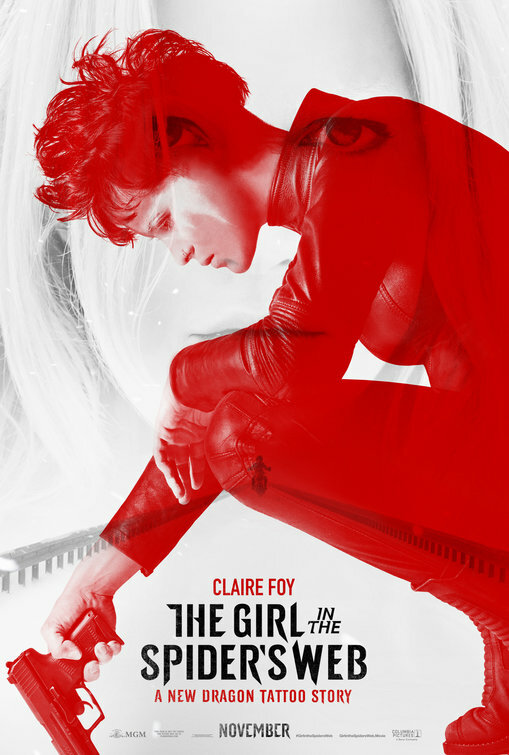 Synopsis: Set in 1950’s London, Reynolds Woodcock is a renowned dressmaker whose fastidious life is disrupted by a young, strong-willed woman, Alma, who becomes his muse and lover. Review: I have to say, for a few years there I was worried that Paul Thomas Anderson and I were going to have to part ways. The director of the stellar Boogie Nights, Magnolia, and There Will Be Blood had released the frustrating puzzlement that was The Master and then capped it all off with the dreadfully gauche Inherent Vice. Our relationship was on the rocks, no question. When it was announced that PTA was reuniting again with Oscar-winner Daniel Day-Lewis for an untitled tale set in the world of 1950’s fashion, I gotta say I was pretty intrigued. Then, the worry set in. Oh no, another too serious contemplation on life that cine-snobs would drool over like the last slice of chocolate cake and the rest of us would scratch our heads at. PTA had taken filmgoers to some great places over his career but I didn’t get much out of the last two rides. Then the stakes were raised even higher when Day-Lewis (Lincoln) indicated Phantom Thread would be his last onscreen performance and he would retire from acting. That’s a lot of pressure to put on a movie. Not only does it have to be a nice bell for Day-Lewis to ring on his way out the door but it has to also hold up to the scrutiny of critics left wanting from PTA’s last efforts. Almost immediately, my initial fears faded as Phantom Thread unspooled. The House of Woodcock is a renowned couture house in London’s posh fashion district. With his intricate designs and supernatural attention to detail, Reynolds Woodcock (Day-Lewis) has created a life and thriving business for himself and his sister Cyril (Lesley Manville, Maleficent) who runs the business side of things. A ‘confirmed bachelor’, Reynolds is a complicated man that has remained unchallenged for most of his adult life. Occasionally haunted by the ghost of his adored mother (literally and figuratively), he sees lasting female companionship as less important than finding inspiration in the fleeting beauty of the women that enter his place of business. Still, there are women in his life and as the film opens his latest live-in lover/muse has come to the end of her tenure and is silently dispatched by Cyril while Reynolds enjoys a weekend getaway. It’s in the restaurant of a seaside village that he meets Alma (Vicky Krieps), a ruddy-faced lass that captivates him the moment she shows up to take his order. Acting on impulse, he invites her to dinner and, eventually, into his life. Alma’s arrival into The House of Woodcock creates a ripple effect that threatens to upset the balance of power between brother and sister as well as artist and muse. In typical PTA fashion, an unspoken darkness begins to envelop the picture as it goes along and we’re never quite sure where these characters are going to end up. Following Alma as she acclimates to her new role as a kept woman who pushes the boundaries of her power, we’re treated to an inside view of the inner-workings of a high fashion house and their celebrity clientele. Royalty get the red carpet treatment from the House of Woodcock and, in an amusing episode, an aging boozy bride to be (Harriet Sansom Harris) pays a price for her very public drunken misuse of her one of a kind hand-made garment. There is something so calming about the way PTA and Day-Lewis have constructed this multi-leveled central character. Reynolds is part mystery and part petulant child, always determined to get his way no matter who he has to bulldoze over. That attitude makes most people roll over for his every whim but not Cyril who, in one thrilling scene, takes her brother to task between sips of her morning tea. Day-Lewis and Manville work together like gangbusters, the closeness between siblings and their troubling co-dependency is evident, made even more complicated when other people enter the equation. Krieps is a real find, going toe-to-toe with Day-Lewis (and, to a lesser extent, Manville) and keeping in step with her famously method screen partner. The final act of Phantom Thread calls on Krieps to scale a seemingly insurmountable mountain of a character flaw but climb it she does. 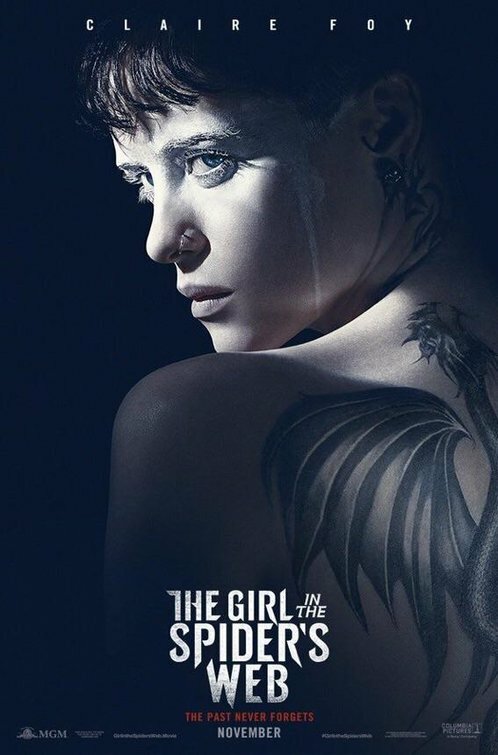 Through audiences may be put off by some of her actions and attitude as she struggles to keep Reynolds close, there’s an oddball charm to her methods. The dynamic between Alma and Cyril could have been explored just a smidge bit more, if only to have a few more scenes to showcase the terrific talents of Krieps and Manville. PTA’s script is often terrifically witty when it’s not outright funny. This feels like his most accessible movie in ages and while I wouldn’t call it ‘audience pleasing’ it’s surely not the alienating watch some of his films have been over the last few years. Acting as his own cinematographer, the director captures the vibrancy of the era excellently displayed in Mark Tildesley’s (Trance) production design and Mark Bridges (Silver Linings Playbook) stunning period costumes. Special mention must also be made to Johnny Greenwood’s gorgeous score. Setting the mood of the film just as effectively as the writing and performances, it isn’t getting the attention it deserves considering the contribution it’s making. Time will tell if Phantom Thread is truly the last time we’ll see Daniel Day-Lewis on the big screen. While I hope he’ll be enticed back if the part and process is right, if this is his swan song, it’s an amazing piece of farewell music to a career with few flaws. 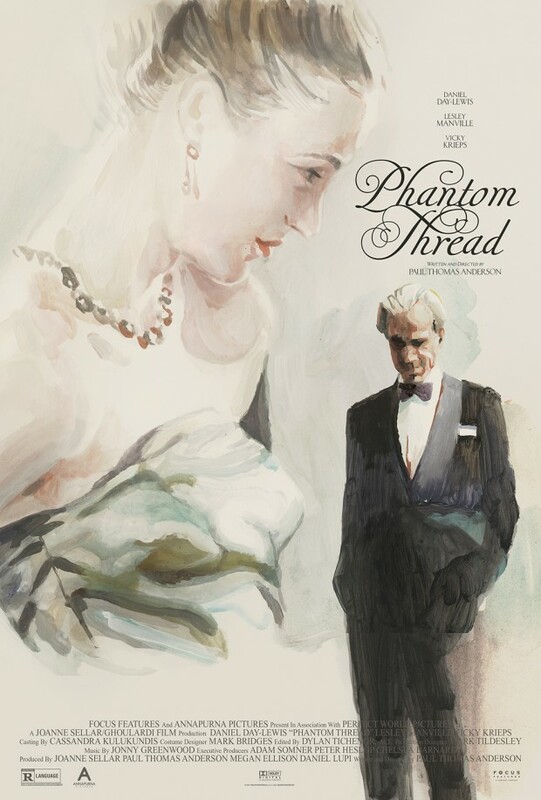 With its premium performances, well-constructed screenplay, patient direction, and sublime technical elements, Phantom Thread is one of the finest films of the year.